Digital India Corporation For Digital India program providing the strategic support to Ministries/Departments of Centre/States for carrying forward the mission of Digital India by way of Capacity Building for e-Governance projects, promoting best practises, encouraging Public-Private Partnerships (PPP), nurturing innovation and technology in various domains. To provide leadership and support to Government of India through MeitY, to steer and anchor Digital India and all related policy and implementation initiatives. To promote digital transactions including digital payments through various medium. To support MeitY in all its initiatives with policy and implementation related issues concerning various ongoing programmes & schemes in ICT domain and new initiatives necessitated as part of the Digital India vision. To support Ministries/Departments, both at Centre as well as at States and other stakeholders in crafting progressive e-Governance strategies, to promote Accountability, Efficiency, Efficacy and Transparency. To source and make available from both the market as well as within government, pool of specialized technically skilled manpower for hardware, software, networks, cyber security and laws, standards, quality and testing etc. in ICT domain to Ministries/Deptts. on charge basis under the Central and State Government. To promote innovation and evolve models for empowerment of citizens through Digital initiatives and to promote participatory governance and citizen engagement across the government through various platforms including social media. To establish the National e-Governance Academy and to put in place an institutional mechanism for capacity building of government and its agencies, including assessment and evolution of suitable training packages/modules for capacity building for the Centre and States for Human Capital formation to enhance competitiveness for successful implementation of various projects/schemes in ICT domain to cut on cost and time over run. 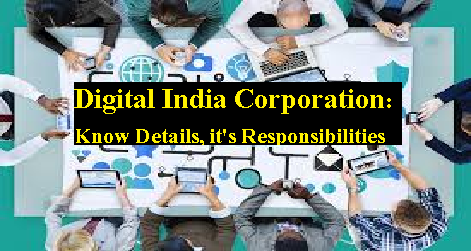 What is Digital India Corporation: It's Responsibilities It will provide the strategic support to Ministries/Departments of Centre/States for carrying forward the mission of Digital India by way of Capacity Building for e-Governance projects, promoting best practises, encouraging Public-Private Partnerships (PPP), nurturing innovation and technology in various domains.